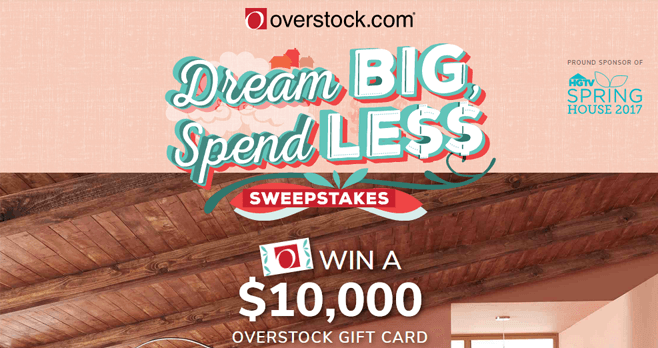 Overstock, proud sponsor of HGTV’s Spring House 2017, is bringing you the Dream Big, Spend Less Sweepstakes where you could win a $10,000 Overstock.com gift card. Fans of the American internet retailer can go online to hgtv.com/dreambig starting on April 17th and register for the HGTV Sweepstakes once per day through May 31st. The Grand Prize Winner will receive a $10,000 shopping spree, awarded in the form of five $2,000 Overstock.com Gift Cards. Visit the HGTVwebsite at www.hgtv.com/dreambig during the Sweepstakes Period. Enter your email address and click the “Begin Entry” button to get started. Complete the entry form as directed by providing your full name, complete mailing address, phone number, date of birth, and cable provider. Click the “Submit Entry” button. You will be instantly entered into the Sweepstakes for that day. Return and participate again daily through May 31st. 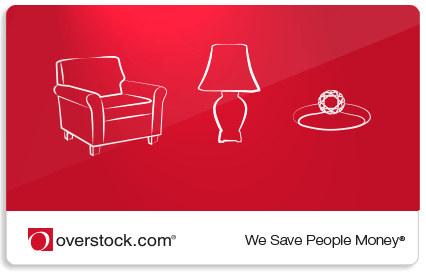 Overstock Dream Big, Spend Less Sweepstakes is open only to legal residents of the 50 United States and D.C. who are 21 years of age or older as of the Promotion start date. Begins at 9:00 a.m. Eastern Time on April 17, 2017 and ends at 5:00 p.m. Eastern Time on May 31, 2017. Limit of one entry per eligible person, per day, during the Promotion Period. The potential Grand Prize Winner will be selected by Sponsor in a random drawing from among all eligible entries on approximately June 2, 2017, and will be contacted by phone on or about June 5, 2017. Approximate retail value of the Grand Prize is $10,000. Beginning on or about June 9, 2017, you may obtain the name of the Grand Prize Winner by going to http://hgtv.com/sweepstakes/. Sponsored by Scripps Networks, LLC dba Home & Garden Television, 9721 Sherrill Boulevard, Knoxville, Tennessee 37932. Administrated by Ritway, Inc., 1463 E. Weisgarber Rd., Knoxville, TN 37909. For complete details, see the Official Rules.